It's pretty safe to say the outcome was heavily influenced by the call that Bradley fumbled before being down. But was it really a fumble? So far pretty much both sides agree that he was down. 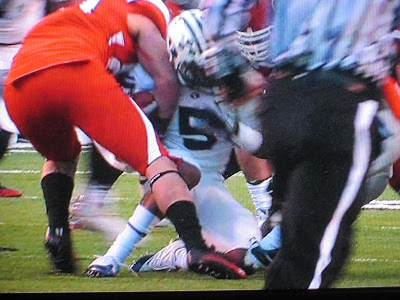 But regardless the call went against BYU. Why was the call made the way it was? We will never know. You make the call, based on the photographic evidence below. Was he down? Even if the call was bad, BYU still had a chance to win, but props must be given to the Utes for an athletic play to race around the edge and block what would have been the game winning Field Goal. I for one believe that BYU is handling this in a very classy way, unlike a previous example of a possibly poor call in the BYU SDSU game. A call that also didn't have nearly the dramatic effect on the outcome of the game as this one did.